With the 2017 Ford F-150, you get a truck that combines modern innovation with rugged performance. Clever designs help you work hard and smart, plus cut down on gas consumption. You also enjoy some of the latest technologies and safety innovations, giving you additional peace of mind. Ford offers seven different models for the 2017 Ford F-150: XL, XLT, Lariat, King Ranch, Raptor, Platinum and Limited. Each one is loaded with features to address your many needs and desires. You also get a surprising array of engines for the Ford F-150, with five choices total. The base option is a 3.5-litre V-6, which puts out 282 horsepower and 253 lb.-ft. of torque. If you're looking to save more on fuel, the available 2.7-litre EcoBoost is a solid way to do that, without sacrificing capability. It still puts out 325 horsepower and 375 lb.-ft. of torque, thanks to turbocharging combining with direct injection. Even more impressive is the 3.5-litre EcoBoost V-6, with a peak 375 horsepower and 470 lb.-ft. of torque. It also uses direct injection and turbocharging to maximize performance, while minimizing fuel consumption. If you're more inclined to choose a conventional engine, the 5.0-litre V-8 is solid. It produces 385 horsepower and 387 lb.-ft. of torque. With this option, you can get an optional CNG/Propane Gaseous Engine Prep Package, which switches out the intake manifold, intake valves and valve seats. With this package, you can run the truck on gas, compressed natural gas (CNG) or propane. Finally, there's a High-Output 3.5-litre EcoBoost for the Raptor. It pounds out a monstrous 450 horsepower and 510 lb.-ft. of torque. Because having a truck is all about getting work done, you can equip the Ford F-150 with some highly utilitarian features. An optional Pro Trailer Backup Assist makes reversing with a trailer hitched to the truck easier and more intuitive. You just turn a knob and not the steering wheel, so the trailer goes where you need every time. Other towing-oriented equipment help take advantage of the maximum 12,200 pound (5,533 kg) towing rating with the 3.5-litre EcoBoost. Dynamic Hitch Assist helps you guide the hitch ball to a trailer receiver without the help of a spotter. Smart Trailer Tow Connector warns of possible problems, and trailer sway control is standard. When it comes to hauling, the Ford F-150 is a true champion. It can handle up to 3,270 pounds (1,483 kg) in the bed. Clever features make the bed more utilitarian, including the optional BoxLink system, LED lights, an integrated tailgate step and stowable loading ramps. Other innovations available for the Ford F-150 help you be more aware of your surroundings. For example, the optional 360-degree camera system lets you see exactly what's around your truck when in a tight spot. You can get an 8-inch productivity screen right between the gauges. Drivers use controls on the steering wheel to cycle through what shows up on the screen, helping to track fuel consumption, off-road settings, towing info and more. 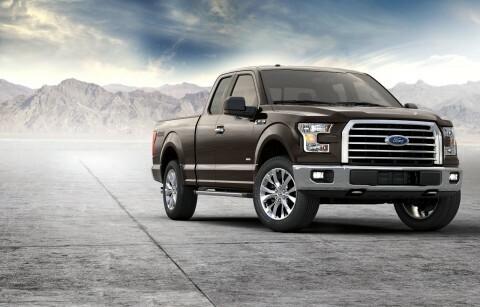 Come check out the huge selection of Ford F-150 we have in stock at our dealership.